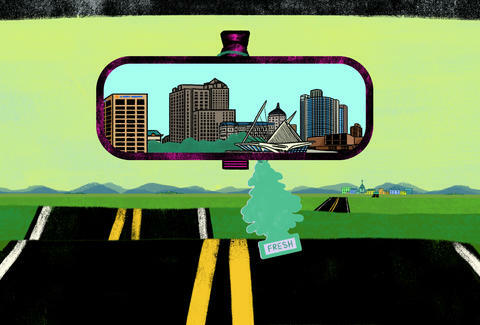 Between the blue sky and the sunshine, summertime in Wisconsin was tailor-made for road trips. Fortunately, our state is full of interesting, quirky towns, so get out of your comfort zone and venture forth to explore the lesser-known areas of not-Milwaukee. Chances are you'll find a new favorite hiking trail, brewery, restaurant, or antique egg timer in any of these small towns. Why it's so great: More charming than its larger neighbor, Eau Claire, Chippewa Falls feels like a village with some city amenities. 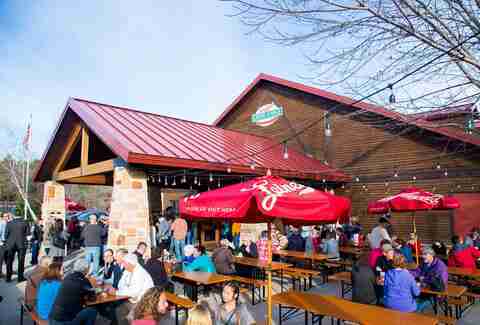 Leinenkugel's Brewery is located here, and you can tour its Northwoods-themed visitor's center and taproom. 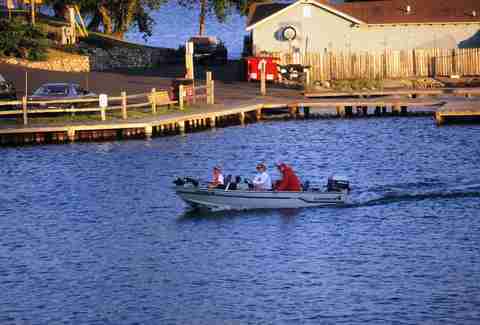 Lovers of the outdoors will appreciate 40 public boat landings in the county, 35 miles of ATV routes, the Hickory Ridge mountain biking trail, and about a million lakes nearby for fishing. On the south end of Lake Wissota lies County Highway X, lined with taverns, restaurants, and supper clubs with stunning lake views. Must-eat foods: Steak and a brandy alexander at High Shores Supper Club; whatever flavor catches your eye at Olson's Ice Cream; homemade pizza at West Hill Bar & Grill. 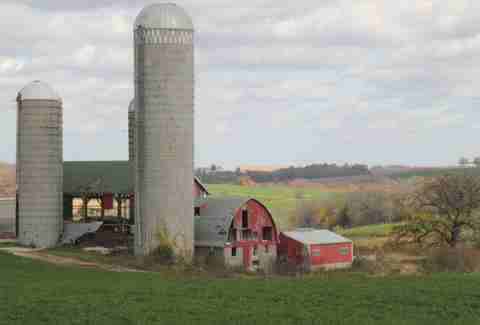 Why it's so great: Forget the college town in New Jersey; Princeton, WI is a bargain hunter's dream destination. 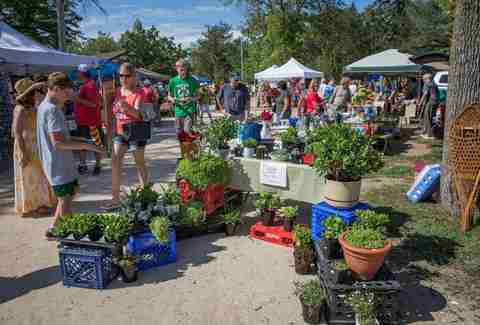 It's home to "Wisconsin's largest weekly outdoor flea market," which is admittedly a lot of descriptors for a flea market. Nevertheless, it's a great place to find anything you could ever want, plus lots of things you never knew you wanted, like dragon lawn ornaments. Once you're tired of browsing knick knacks at 10am (it starts at 6am every Saturday), switch gears and head over to some of the town's many antique stores. Must-eat foods: Breakfast bread pudding or sticky bun French toast at Once in a Blue Moon Cafe; burger and cheese curds at Buckhorn Bar & Grill. 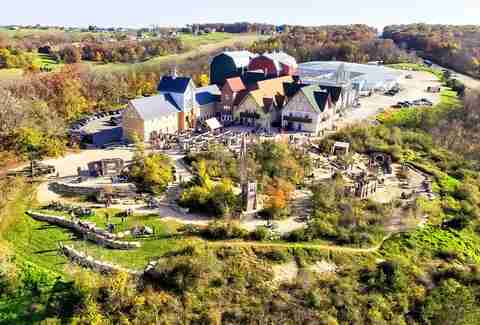 Why it's so great: If you've never heard the words "New Glarus," then you're not from Wisconsin: It's the name of one of our most beloved breweries, which is named after the town it's located in. Yes, you can certainly tour the brewery and visit the taproom and gift shop, but there's more to do in this small town. The town was originally settled by Swiss immigrants, and you’ll see Swiss influences throughout; many buildings look like chalets, Swiss flags hang right next to American flags, and the place is full of traditional Swiss foods like kalberwurst and Stollen. There's also a Heidi festival in June -- basically a traditional celebration with food and live music -- and plenty of yodeling throughout the year. Must-eat foods: Roesti or fondue at Glarner Stube; savory French toast with Door County cherries, pork belly and sunny-side-up duck egg at Cow & Quince; fudge from Maple Leaf Cheese & Chocolate Haus. Why it's so great: When you think of "up north," you're probably picturing someplace like Minocqua. It's heaven for fans of watersports (the town's center is even located on a peninsula surrounded by lakes), and fishing, boating, and water skiing are the most popular activities around here. When you've had enough of the water (or it's just dark out), head to a supper club for dinner where you can feast on the walleye everyone caught but you. And don't skip visiting Northern Waters Distillery where you can sample spirits, take a tour, and throw back a few cocktails. Must-eat foods: Broiled walleye almondine at Norwood Pines; all-you-can-eat lumberjack breakfast with buttermilk donuts at Paul Bunyan's; Chicago-style dogs at Hoggie Doggies. Why it's so great: This town of about 1,600 people is home to two of the biggest tourist attractions in Wisconsin: Taliesin and The House on the Rock. 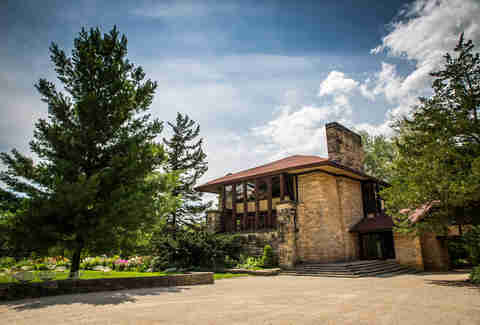 Taliesin was built by famed architect Frank Lloyd Wright in 1911, though it was rebuilt a number of times due to fires, and he used it as his peaceful summer home and studio for most of his life. The House on the Rock, on the other hand, is a kind of frenetic museum of insane collections. If the self-playing orchestra doesn't creep you out, then the room of antique dolls certainly will. The glass "infinity room" that juts out over a ravine for a panoramic view is also scary, but in a less nightmare-inducing way. Must-eat foods: Smoked trout dip at Freddy Valentine's; trout dinner, available some Fridays, or any deli sandwich at Driftless Depot. 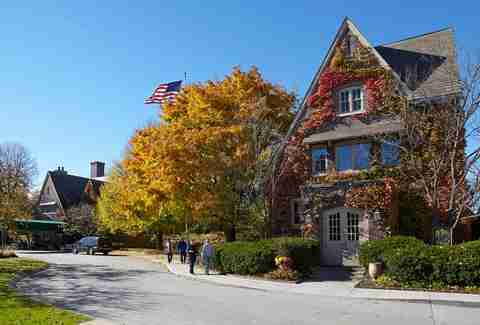 Why it's so great: Incorporated as a planned industrial community in 1912 and designed by the same landscape architect as Central Park in NYC, Kohler is pretty much one giant resort town. Thanks to the money the Kohler Co. is raking in from manufacturing kitchen and bath fixtures, you can now golf at a couple world-class courses, stay in a hotel room with a shower that jets water from six different places, and eat at the resort's many fancy restaurants. The resort's spa offers a ton of hydrotherapy and bathing treatments, naturally. Must-eat foods: Fried cheese curds at The Horse & Plow; Sunday brunch at The Wisconsin Room; tasting menu at The Immigrant. Why it's so great: Mount Horeb is a town filled with trolls: not the bullying internet type, but the Norwegian folklore variety. Harking back to the town's Scandinavian heritage, the Chamber of Commerce decided to embrace the quirkiness and named the main street the Trollway to attract visitors after a highway bypass was created around the town in the ‘70s. There are dozens of wooden trolls around the town, carved by one local man, Michael Feeney, and there's even a troll map, so you can be sure to get an Instagram-worthy selfie with your favorite one. Must-eat foods: Beer and an "uff da" pretzel at Grumpy Troll Brewery; any breakfast pastry or Swedish meatballs at Sjolinds Chocolate House. 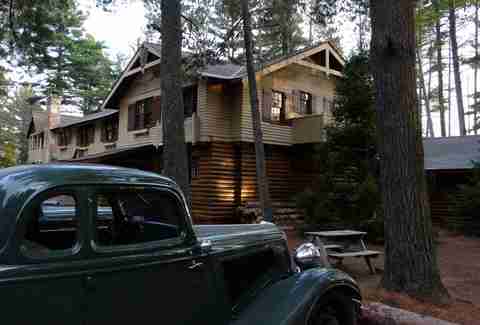 Why it's so great: Infamous gangster John Dillinger loved vacationing "up north,” and when he and his gang stayed at the Little Bohemia Lodge in Manitowish Waters one weekend in 1934, the FBI got wind of their whereabouts. What followed was a botched raid on the lodge where the Dillinger gang escaped. You can visit the lodge and see bullet holes from the raid, check out historic memorabilia, and eat a tasty meal. It was also where parts of the movie Public Enemies was filmed, making it a destination Johnny Depp fans as well. Besides the lodge, you’ll find all the classic northwoods activities like fishing, hiking and drinking on pontoon boats, plus a museum dedicated to the grocery chain A&P. Must-eat foods: Schnitzel at Little Bohemia Lodge; anything Cajun or Creole at Blue Bayou Inn; cheeseburger at The Pea Patch. 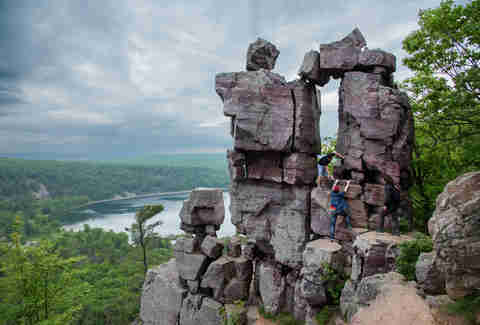 Why it's so great: Baraboo often gets overlooked for its more touristy brother, the Wisconsin Dells -- but if you've ever taken a Dells boat tour, then you know that the entire area has some amazing scenery. Head just south of Baraboo to Devil's Lake State Park for some of the most scenic vistas in the state; just east is Parfrey's Glen, a ravine trail that looks like something out of The Lord of the Rings; and nearer to town is Pewits Nest, a glacial gorge with a majestic waterfall that's open for swimming. If all of that's still not enough nature for you, head to the International Crane Foundation and check out some of the birds. Nature, you rock. Must-eat foods: Brandy glazed salmon and a cocktail at Driftless Glen Distillery; Moroccan chicken wrap at Little Village Cafe; cheeseburger and fries at Square Tavern. Lacey Muszynski is a Milwaukee native. Follow her on Twitter @worthhersalt.